Journalism Matters is a chance for news media titles to tell their readers about the important job they do and why they do it. Anyone can take part by voicing their support for their newspaper and the highly trusted local journalism which underpins democracy. Use key campaign hashtags #journalismmatters #makingadifference #trustednewsday and #buyapaper. Hold a reader surgery inviting readers to come and meet your journalists and find out more about the newspaper. 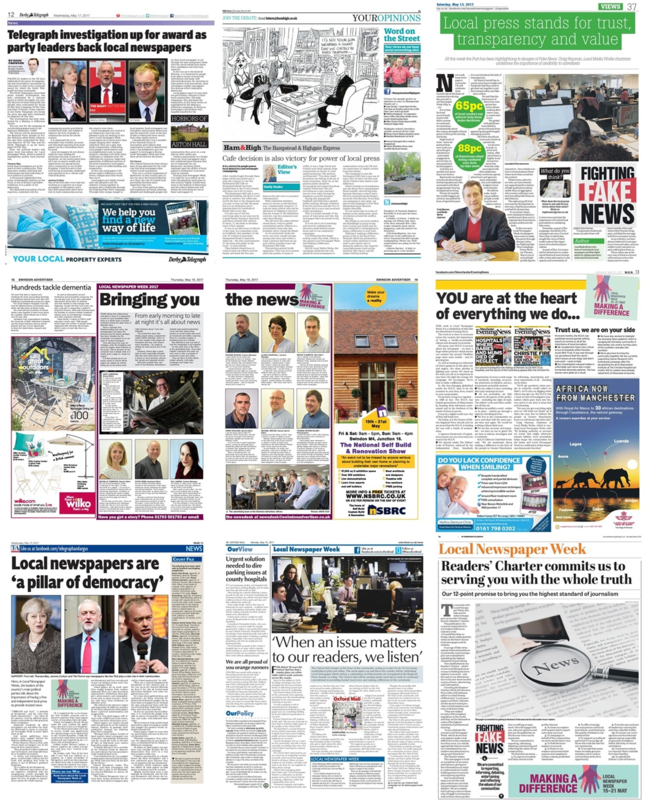 Making a Difference showcases the best campaigning work of local papers across the UK. At the start of LNW, an online vote will go live and the public will be invited to vote for their favourite campaign from the Making a Difference showcase. The winner will be announced at the Society of Editors Regional Press Awards on 18 May in London. Newspapers included in the shortlist can run stories in the run up to and during the vote encouraging readers to back their campaign. Editors and journalists can also use social media to secure the backing of readers, local MPs, and celebrities. On 16 May, the day before the Regional Press Awards, the industry will hold a #trustednewsday to show readers exactly how trusted news is gathered, produced and distributed over the course of the day. Newspapers can get involved by hosting interactive events including live blogs revealing the workings of newsrooms on a day-to-day basis, and question and answer sessions with editors and journalists about your work. Last year, the #trustednewsday Thunderclap reached 2.5 million accounts and the hashtag trended on Twitter. For queries or questions about Journalism Matters please contact Paul Sinker paul@newsmediauk.org or Jessica Jones jessica@newsmediauk.org or call on 020 7963 7480.